I was totally amused by Hit and Nun by Peg Cochran. From the title, you might think it's about a convent ... from the cover, you know there's pizza involved. But how do nuns and pizza tie together? The heroine of the story, Lucille Mazzarella, is an old-school middle-aged Italian wife and mother who works part time for a church. 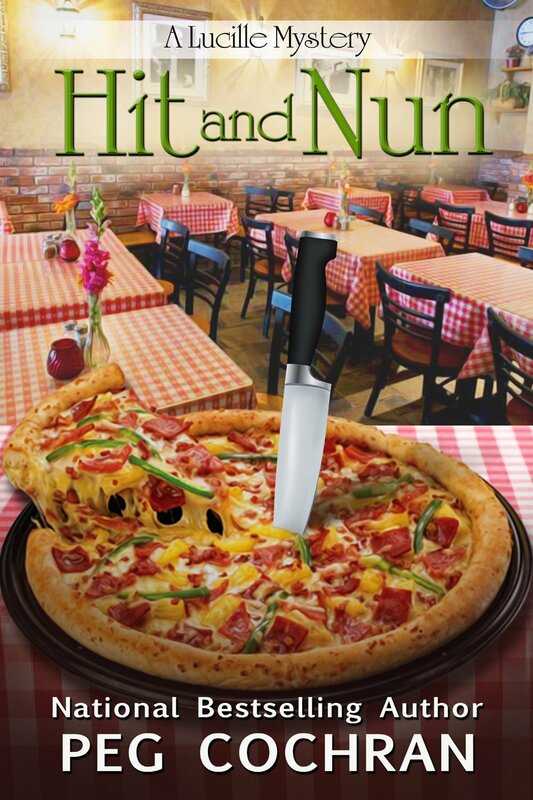 That doesn't sound like the setup for a mystery novel ... but then Lucille is the sole witness when the owner of a nearby pizza parlor stumbles into the church and dies. But he's not dead from natural causes - of course, he's been murdered. Lucille apparently has a reputation as an amateur detective ... of course ... so she and her gal-pal Flo get themselves involved in figuring out who the murderer is. No only does Lucille feel responsible because the guy died in front of her, but he was also the owner of her favorite pizza place. Lucille goes as far as applying for a job at a competitor's pizza parlor - she suspects he might be involved - and all while she manages to cook for her husband and extended family, and annoy her adult daughter who has moved back into Lucille's home with her husband and infant..
A running joke through the book is that Lucille read about the paleo diet in a magazine at the "Clip and Curl" while she was waiting to get her hair done, and she decides to give it a try. Of course, she didn't read the whole article, so the reasoning she uses to decide what "cavemen" ate is pretty funny. Lucille is an interesting character. She goes from being down-to-earth and traditional to being goofy and flighty in the blink of an eye, but somehow it works. By the end of the book, some of the decisions she makes are downright daft, but it still works. By that time, we're used to her goofiness, and we follow along on the ride. This is definitely a lighthearted mystery that won't give you the creeps late at night, but will leave you shaking your head and laughing. I received a digital version of this book at no cost to me for the purpose of a review.